"The quote on the left [see image to the right] is not Robertson's at all. It is a quotation of 1 Corinthians 6:9–10. Remarkably, two of the three quotes attributed to Robertson... are not Robertson's words at all but rather direct quotes from the New Testament (the other coming from Rom 1:24–32). "It's also worth noting that Pope Francis presumably agrees with these quotes from the apostle Paul, which have long guided Catholic tradition in this area; he has simply changed the rhetoric surrounding the issue to emphasize that the Church does not and (at least in terms of doctrine) has never reduced people to behavior or desires, emphasizing that a person is more than his/her sexual preferences or choices. Robertson, of course, said much the same thing, though far less eloquently than the philosophically-trained Pope, in his GQ interview. "How exactly the Pope interprets these passages [emphasis mine] is unclear, and that's the discussion that would be more valuable here. Instead of ripping Robertson for quoting these passages, the more worthwhile discussion concerns Robertson's interpretation and application of these passages in the modern day. But instead, numerous media outlets have irresponsibly misattributed these quotations with the presumed aim of demonizing Robertson without such a discussion. The way many have latched onto Pope Francis' rhetorically attractive but still firmly traditional quotations without acknowledging that he continues to uphold traditional church teaching (the 'only' in the above quote [to the right] is quite significant) is similarly problematic." This is well put, and is the same problem we've seen repeatedly when post-9/11 critics quote the Qur'an and are then accused of misrepresenting the Qur'an. It happens all the time to Robert Spencer when he quotes militant passages preaching hate and warfare against non-Muslims, and when he furthermore points out that there is currently no mainstream sect of Islam or school of Islamic jurisprudence that has officially re-interpreted or spiritualized these passages. (All four schools of Islamic jurisprudence still teach that the Muslim community should wage war against unbelievers and subjugate them under its rule.) Of course, there are millions of Muslims who ignore this and choose to co-exist peacefully with others; but that doesn't change what the Qur'an actually teaches and what mainstream Islam continues to uphold. As an analogy, the Catholic Church continues to affirm the intrinsic immorality of contraceptives, even if many Catholics ignore the teaching. 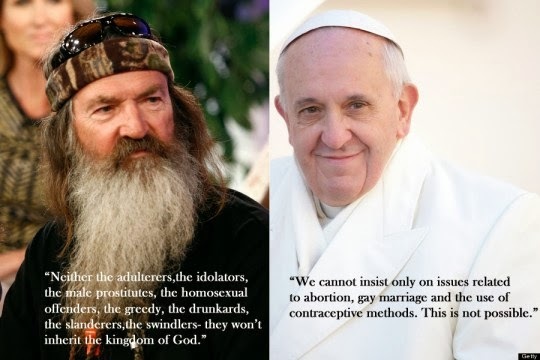 The point is that Phil Robertson is not "misrepresenting Christianity". He is citing Paul verbatim. Now, one might argue that he is taking Paul's statements out of context, but frankly I don't even think that's the case, because Paul's indictments largely transcend his sitz im leben. Scholars tell us he was swiping temple prostitution (pederasty) as part of his attack in Rom 1:24-32 and I Cor 6:9-10, and while that's undoubtedly true, it's not the whole story. The apostle hated male homosexuality across the board. The flip-side, however, is worth noting: like the rest of the bible, Paul is silent on the subject of female homosexuality if Rom 1:26 points to alternative heterosexual behavior instead of lesbianism. This isn't surprising: as the product of an honor-shame macho culture, he was (certainly) homophobic about male homo-eroticism, and (possibly) indifferent to female homo-eroticism. I admire Paul greatly as an historical figure and early Christian thinker, but I consider his views on (male) homosexuality to be obsolete -- as obsolete as his instruction for women in the church. I take for granted there is nothing remotely immoral or wrong about homosexual behavior between two consenting adults. Jason Staples probably thinks differently. But where we agree is on how issues like this should be assessed. If someone is unambiguously upholding Paul's position, that should be acknowledged instead of implying that he's fabricating his own bigotry; if someone more admirable (like Pope Francis, whom I do have much respect for) is more delicately upholding Paul's position, that too should be called out for what it is. When Islamic radicals cite the necessity of the jihad, they are doing justice to their Qur'an, and it's not "Islamophobic" to point this out. It is not hateful to point out hateful passages or homophobic ones. If we're going to confront problems like holy wars and homophobia, we need to do so honestly, and the honesty begins by acknowledging that problems like these are often embedded in the scripture of one's religion. They won't go away by pretending that they're overblown, misunderstood, or even invented by fringe fanatics or bigots.